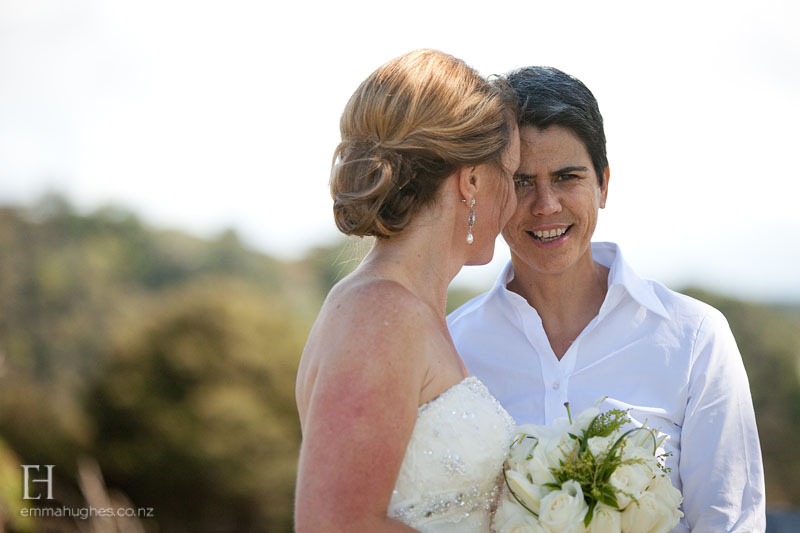 Caroline and Sarah tied the knot in a gorgeous wedding in Waiheke. The look they wanted was elegant and authentic – with lots of laughter and ease about it. They particularly wanted our guests to feel looked after and for them to have a special time. The dress was a Maggie Sottero design called ‘Doreen’ from Astra Bridal. 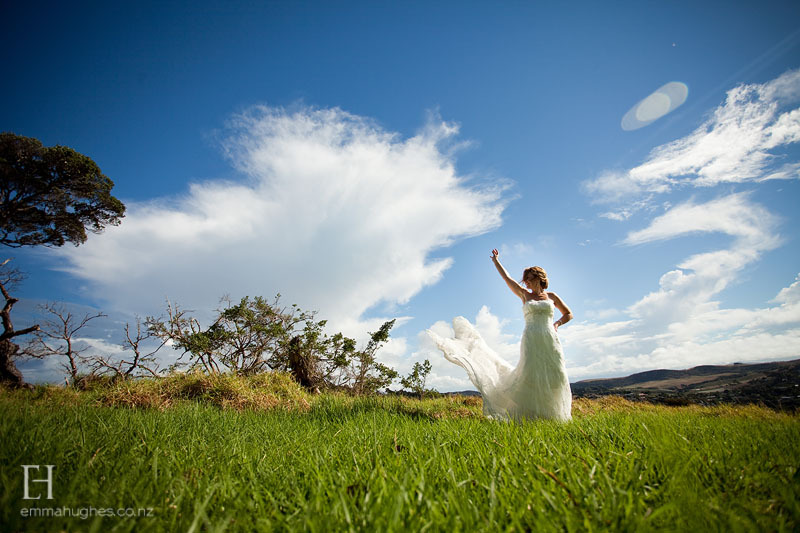 Lisa from Astra Bridal, Wellington, was great to work with – she put me at ease and made me feel that I could take my time. Averil tailored the dress and made such a professional job of it – it looked even more fabulous and I felt like it was truly made for me when she’d finished. Most memorable moment: Seeing Caroline when I got to the top of the steps at Mudbrick. In that moment she was all I could see and nothing else mattered. The whole ceremony itself was pretty special for us too. We handed our rings around to our guests to hold before giving them to one another; we had a time capsule which was made by NZ artist Fane Flaws in which we have put a lovely bottle of Mudbrick wine, our vows, letters from our parents, and notes from our guests – we’ll open it on our five-year anniversary; we also shared a loving cup – a Celtic tradition where each drinks from the cup as the other holds it (a true test of trust when wearing a wedding dress!). What would you give as advice or recommend to other brides: Everyone says this but I don’t know that it can be said too much... just relax and be present on the day. It will go by so fast and you don’t want to miss that amazing sensation of love and connectedness that I think is a part of so many weddings. Hair and makeup: Sharon Kenny (Auckland based) did the hair and makeup for both our mothers, the bridesmaids, our flower girl and me. We were a pretty diverse group – ages ranging from 9 to late 70’s and different ethnicities with varying levels of comfort with makeup. Sharon was fantastic – she put everyone at ease and made us all look like ourselves at our most beautiful. The photos are the evidence. Flowers: Waiheke Flower Gallery (Virginia) – we just had simple white and green bouquets - roses and lilies with some harakeke to add texture and contrast. The buttonholes were white roses with green berries and harakeke. 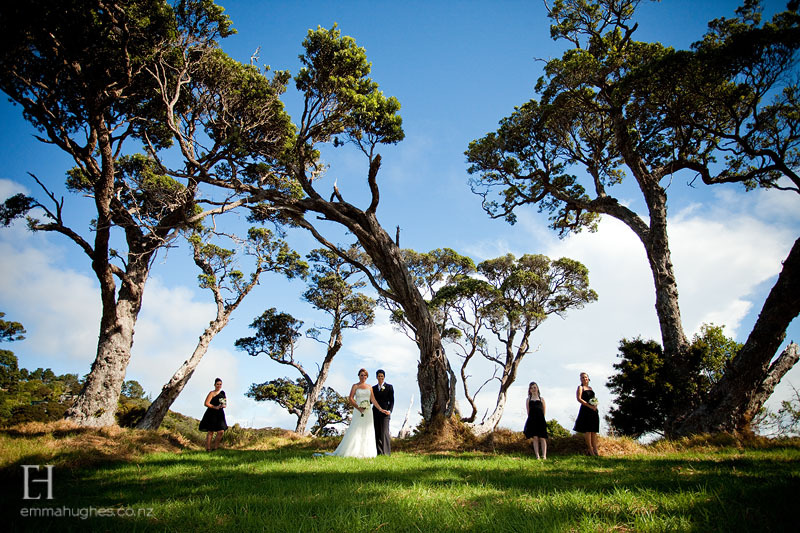 Location (Ceremony and Reception venue) including catering: Mudbrick Vineyard, Waiheke Island – we worked with Justine Hoggard at Mudbrick and she was supremely professional (as were all the staff there). 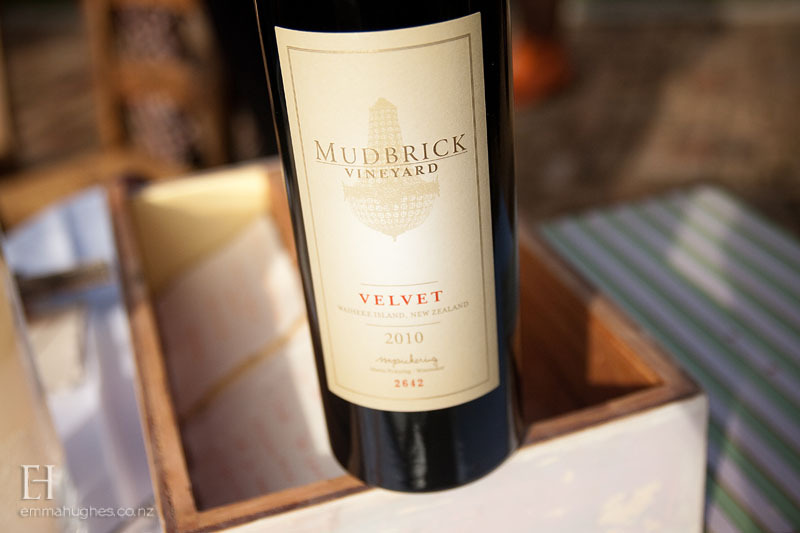 It would be impossible to have a bad (or even average) wedding at Mudbrick – it’s such a stunning venue, the food is delicious and everything about our day ran so smoothly. Entertainment: Rick Hoggard, DJ – in addition to managing the music seamlessly, Rick had really helpful advice about what makes the music work at a wedding. Stationery: Cocoa Berry. Smart, professional, and tailored products. Lots of positive feedback from our guests. 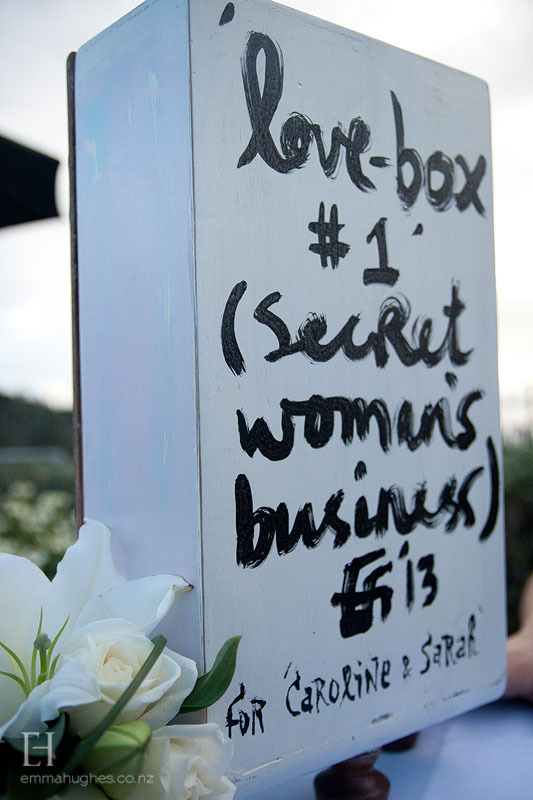 Photography/videographer: Emma Hughes, Waiheke – our photos speak for themselves. I have to confess I hate having my photo taken and always expect to look dreadful. I love our photos – can’t stop looking at them. We were very lucky to find Emma and Lance. Wedding planner: Me!! (I’ll know better next time…). Transport: Waiheke Executive Transport picked up and dropped off our guests – we chauffeured ourselves. Celebrant: Chris Mullane was our celebrant and MC for the reception. 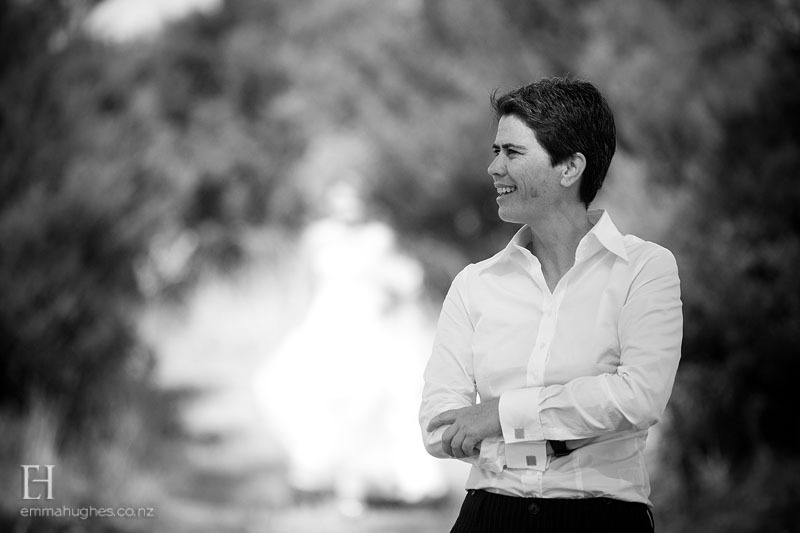 Chris made our wedding – we can’t say enough about how extraordinary he is. A lovely man who worked with us to personalise our day and make our guests a very integral part of it. Through his skillful story-telling we had lots of laughter and moving moments in perfect balance.